From this place, after travelling to the west for four yojanas, (the pilgrims) came to the city of Gaya; but inside the city all was emptiness and desolation. Going on again to the south for twenty le, they arrived at the place where the Bodhisattva for six years practised with himself painful austerities. All around was forest. Three le west from here they came to the place where, when Buddha had gone into the water to bathe, a deva bent down the branch of a tree, by means of which he succeeded in getting out of the pool. Two le north from this was the place where the Gramika girls presented to Buddha the rice-gruel made with milk. Two le north from this (again) was the place where, seated on a rock under a great tree, and facing the east, he ate (the gruel). The tree and the rock are there at the present day. The rock may be six cubits in breadth and length, and rather more than two cubits in height. In Central India the cold and heat are so equally tempered that trees will live in it for several thousand and even for ten thousand years. Half a yojana from this place to the north-east there was a cavern in the rocks, into which the Bodhisattva entered, and sat cross-legged with his face to the west. 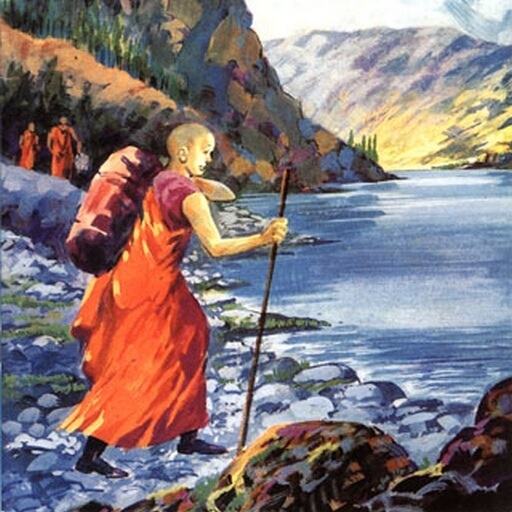 (As he did so), he said to himself, “If I am to attain to perfect wisdom (and become Buddha), let there be a supernatural attestation of it.” On the wall of the rock there appeared immediately the shadow of a Buddha, rather more than three feet in length, which is still bright at the present day. At this moment heaven and earth were greatly moved, and devas in the air spoke plainly, “This is not the place where any Buddha of the past, or he that is to come, has attained, or will attain, to perfect Wisdom. Less than half a yojana from this to the south-west will bring you to the patra tree, where all past Buddhas have attained, and all to come must attain, to perfect Wisdom.” When they had spoken these words, they immediately led the way forwards to the place, singing as they did so. As they thus went away, the Bodhisattva arose and walked (after them). At a distance of thirty paces from the tree, a deva gave him the grass of lucky omen, which he received and went on. After (he had proceeded) fifteen paces, 500 green birds came flying towards him, went round him thrice, and disappeared. The Bodhisattva went forward to the patra tree, placed the kusa grass at the foot of it, and sat down with his face to the east. Then king Mara sent three beautiful young ladies, who came from the north, to tempt him, while he himself came from the south to do the same. The Bodhisattva put his toes down on the ground, and the demon soldiers retired and dispersed, and the three young ladies were changed into old (grand-)mothers. At the place mentioned above of the six years’ painful austerities, and at all these other places, men subsequently reared topes and set up images, which all exist at the present day. Where Buddha, after attaining to perfect wisdom, for seven days contemplated the tree, and experienced the joy of vimukti; where, under the patra tree, he walked backwards and forwards from west to east for seven days; where the devas made a hall appear, composed of the seven precious substances, and presented offerings to him for seven days; where the blind dragon Muchilinda encircled him for seven days; where he sat under the nyagrodha tree, on a square rock, with his face to the east, and Brahma-deva came and made his request to him; where the four deva kings brought to him their alms-bowls; where the 500 merchants presented to him the roasted flour and honey; and where he converted the brothers Kasyapa and their thousand disciples; — at all these places topes were reared. At the place where Buddha attained to perfect Wisdom, there are three monasteries, in all of which there are monks residing. The families of their people around supply the societies of these monks with an abundant sufficiency of what they require, so that there is no lack or stint. The disciplinary rules are strictly observed by them. The laws regulating their demeanour in sitting, rising, and entering when the others are assembled, are those which have been practised by all the saints since Buddha was in the world down to the present day. The places of the four great topes have been fixed, and handed down without break, since Buddha attained to nirvana. Those four great topes are those at the places where Buddha was born; where he attained to Wisdom; where he (began to) move the wheel of his Law; and where he attained to pari-nirvana.